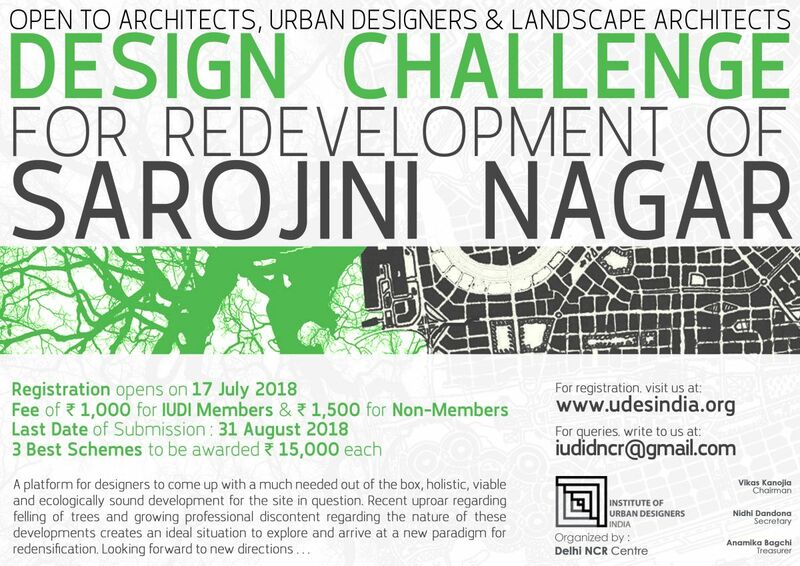 IUDI Delhi NCR Centre launches Design Challenge for the Redevelopment of Sarojini Nagar - ArchitectureLive! For a long time now, professional opinion regarding the structure and density of Delhi has revolved around the disbalanced density between the city core and the periphery. With mounting pressures on land as a resource, urban sprawl stretching the limits of the city and consequent problems with urban transportation and environmental degradation the need to densify existing precincts of the city becomes evident. However several issues regarding densification arise immediately. The prime issues relate to the feasibility of re-development of existing precincts with respect to the environment and urbanism. In July 2016, the Union Cabinet, Chaired by the Hon’ble Prime Minister Mr. Narendra Modi, approved the redevelopment of seven GPRA (General Pool Residential Accommodation). These projects are aimed at increasing the available residential units by almost two fold and are to be self financed. The recent public outcry against the felling of trees at some of these sites has brought to clear view the insensitive and short sighted approach towards the development of such nature. Most of the proposed redevelopments are energy intensive, large scale developments characterised by high rises and seemingly isolated from its immediate built context. Given the poor environmental quality in our city, felling of mature trees thereby denuding these areas that act as a green lung for the city is in itself alarming. What it also does, is to highlight the nature of the design solutions for such large developments. The desire to maximise built up area and use the location to utmost advantage underlies the need to create deterministic designs which are far removed from the ground reality of a residential precinct within the city. This scenario opens up a possibility to examine for ourselves, better alternatives for these schemes with the aim to develop urban design strategies to achieve the objectives of increasing density, providing new built stock, and create an environmentally sustainable self-financing development type. It is an opportunity to search for an appropriate urbanism that stems out of an understanding of the physical, ecological, economic, technological and social structures and networks.